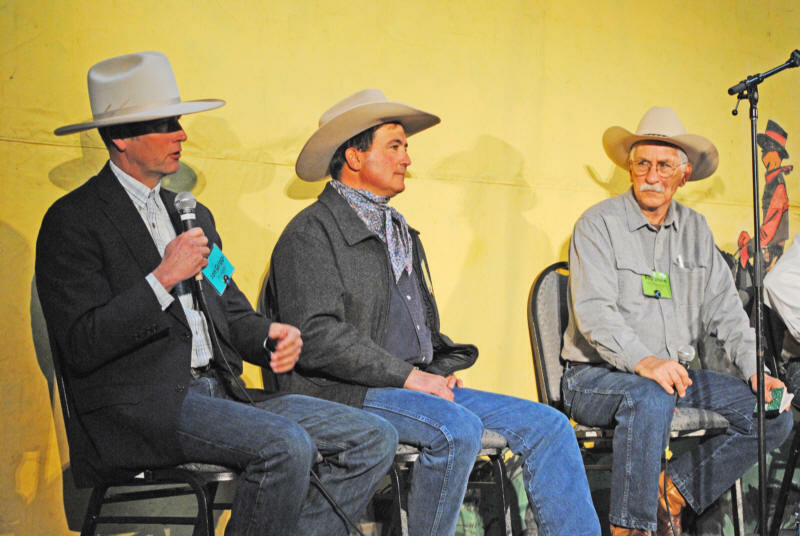 For the 26th National Cowboy Poetry Gathering, the Western Folklife Center, Elko, Nevada invited the Seminole and “Cracker” cowboys from Florida and swamp cowboys from Louisiana to be their featured guests. Invited guests included poets, storytellers, cooks, Creole zydeco musicians, craftspeople and Seminole Indian cowboys. Creole cowboy Geno Delafose and his band, French Rockin’ Boogie, performed during the Gathering and at the Friday Night Dance. Their regional specialty, Zydeco, is a lively music played for dancing. When he’s not playing music, Delafose is operating his Double D Ranch outside of Eunice, deep in Southwest Louisiana’s bayou country, where he breeds cattle and raises American Quarter Horses. Jim Harrison designed the poster for the 26th Gathering Elko Gathering. Jim is an award-winning graphic designer and artist from Gainesville, Florida. Most people today believe that the cattle industry and “cowboy culture” were first established in the American West, and over the years popular movies and media have supported this idea, but Florida is one of the major producers of beef cattle in America and ranks third in cow numbers in the United States. 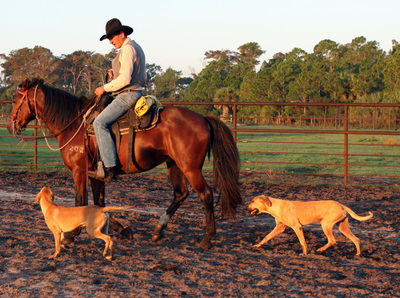 Florida's unique ranching traditions have been adapted to the subtropical climate and influenced by the state's distinctive history. Florida has more than one million cattle and produces more beef than some western states, including Nevada. 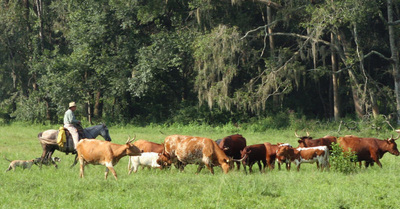 Cattle ranching is one of Florida's oldest and most important cultural and occupational activities. In 1513, Spanish Explorer Juan Ponce De Leon, the first recorded European to land in North America, came ashore in Florida. Upon his second voyage to Florida in 1521, he brought cattle, horses, citrus, and fellow pioneers to settle the new land. This expedition landed on the southwest coast of Florida and off-loaded the first cattle and horses in what later became the United States of America. Soon after, they were forced to make a rapid retreat from Florida when Ponce De Leon was mortally wounded in a battle with the fierce Calusa Indians. The Andalusian-bred livestock that arrived on that voyage and the voyages to follow ran wild, reproducing and roaming throughout Florida for hundreds of years. More Spanish explorers followed, and, as the area became settled, the Florida cattle industry began to develop. Later, the Seminole Indians rounded up herds of the wild cattle and horses that were descended from the original Spanish stock and became the first American cattlemen. Some of those Seminole descendants still maintain cattle in Florida to this day. In the 19th century, settlers who were mainly of Celtic and British descent came down to Florida from Georgia and the Carolinas. Some brought their own cattle with them and some rounded up the wild Spanish-descended cattle. Some of these settlers even purchased cattle from the Seminole Indians in order to begin their ranches. Those pioneering Celtic and British families were a major influence in settling the state of Florida. Many of these families’ descendants still own and run the ranches in the cattle heartland of South/Central Florida today. The term “Cracker” has been historically used to refer to these early settlers and it is a somewhat controversial term. Some claim that it comes from the rifle-like “crack” of the Florida cowman’s whip; Most modern Florida cattlemen are proud to be called “Florida Crackers,” as it symbolizes being part of a unique and little-known culture. Along with sharing their music and poetry, discussion sessions were held at the Gathering to point out the similarities and differences in the cowboy culture of Florida and that of the Great Basin. One such was a Roundtable Discussion on Working Cattle Dogs with participants Billy Davis, Darryl Guillory, Jon Griggs, and Mitch Heguy. 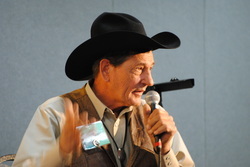 The moderator was Bob Stone of the Florida Folklore Program. The Florida and Louisiana cowboys raised mostly Black Mouth Cur hounds and the Nevada ranchers liked the Border collie. Florida cow dogs are bred with one purpose in mind: to produce dogs that work well with cattle. Specific breeds might be included in the mix. Probably the most popular is the Southern Blackmouth Yellow Cur, also known as the Blackmouth Cur. Although the origins of the Blackmouth Cur are debated, it is now a recognized and registered breed. Another dog breed popular in Florida and Louisiana is the Catahoula Leopard, which has its origins among the French or Native Americans of Louisiana. However, the Florida cowman has no interest in purebred dogs; they are often too nervous, or have other weaknesses. 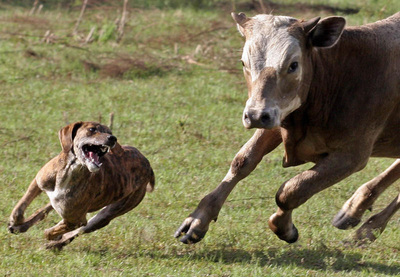 Good cow dogs might contain strains of cur, for all around endurance and good working traits; hound, for long wind; and bulldog, for strength and aggressiveness. Mature male cow dogs usually weigh sixty to seventy pounds, females five to ten pounds less. 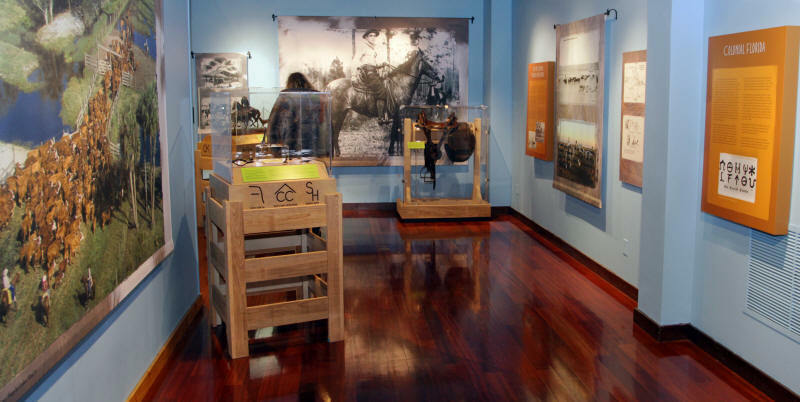 The Western Folklife Center installed a new exhibition in its Wiegand Gallery for the 26th National Cowboy Poetry Gathering, in Elko. Florida Cattle Ranching: Five Centuries of Tradition explores the history and contemporary culture of the Florida rancher and cowboy, known as "Crackers," a moniker that refers to the pioneer descendents of the state as well as to the sound of the cow whip he (or she) traditionally uses to help move cattle through the tough;; Florida terrain. Florida Cattle Ranching: Five Centuries of Tradition includes historical and contemporary occupational gear, clothing and tools of the trade used by Florida cowmen, as well as photographs and original artwork depicting them at work and play. This exhibition will be on display in the Wiegand Gallery until July 24, 2010. The Wiegand Gallery is open from 10:00 am to 5:30 pm Monday through Friday and from 10:00 am to 5:00 pm on Saturday. As usual at the Poetry Gathering, numerous concurrent events took place including a ranch tour and several art and gear shows. Workshops ran the gamut from traditional rawhide braiding with Doug Grove to digital photography with Jay Dusard and Kurt Markus. One of several good gear shows, the Great Basin Gear Show and Sale at the Northeastern Nevada Museum was a collection of cowboy gear from contemporary western artists and craftsmen which included saddles, bits, spurs silver engraving and rawhide. JM Capriola and The Elko Convention and Visitors Authority sponsor the show. Also on exhibit in the Halleck Bar Gallery complimenting the Gear Show were original paintings by Genny Albitre. At another highlight of the music presentations, perennial favorite Ian Tyson, songwriter and musician, from Alberta, Canada, was named and presented with the Western Horseman of Year award by editors A.J. Mangum and Jennifer Denison of the Western Horseman Magazine. Ian says, "I'm trying to ride home, to complete the circle in a way that validates my art. I'd like to continue to be creative, because I still have something to say." The Western Folklife Center is committed to sharing cowboy cultures from around the country and the world at their annual festival. In the past, it has presented cattlemen and women and their artistic traditions from places as far away as Mongolia and South America. In 2011, the event will welcome Csikos, horsemen from the plains of Hungary. Information on National Cowboy Poetry Gathering is available online at www.westernfolklife.org, or by calling 775-778-9695.